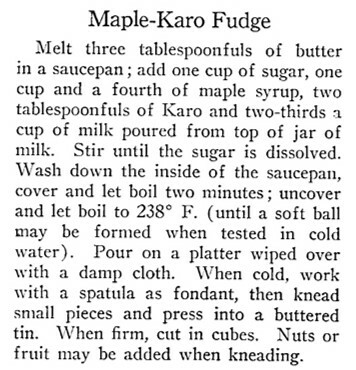 I love the flavor of maple syrup, so was thrilled to find a hundred-year-old recipe for Maple-Karo Fudge. I also was intrigued that the recipe called for Karo corn syrup. Many modern candy recipes call for corn syrup, but this is the first century-old candy recipe I’ve seen which listed corn syrup (and branded corn syrup at that) as an ingredient. Times were a-changing. There are lots of pros and cons to adding corn syrup. The addition of corn syrup makes the fudge smoother and reduces the likelihood that the sugar will crystallize; but, at the same time, corn syrup is a man-made sugar that may not be healthy for us (though the Karo of a hundred years ago was not “high fructose” like modern corn syrups, so it may have been a tad healthier). 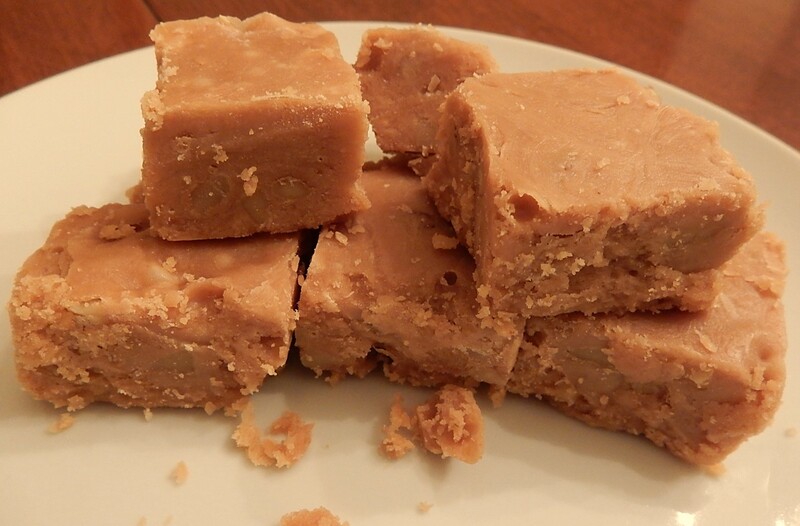 The verdict – Maple-Karo Fudge has a nice texture, and a delightful maple flavor. I added walnuts to the fudge mixture, and the nuts nicely complemented the sweetness of the maple syrup. Wipe a large plate or platter with a wet paper towel, and immediately pour the cooked fudge mixture onto the platter. Let cool then use a spatula to “knead” the mixture by lifting the edges and moving them to the center. Continue “kneading” until the mixture stiffens, and is smooth and shiny (about 10 minutes). If desired, the later part of the kneading may be done by hand rather than with a spatula – though I did it all with a sturdy spatula. If desired add chopped nuts or fruit while kneading. Press into a small buttered pan, about 6″ by 6″. Let sit for several hours. When firm, cut into squares. Posted on December 2, 2018 December 1, 2018 by SherylPosted in FoodTagged candy, recipe. Looks so good. I love fudge. It’s a lovely fudge recipe. Hmmm, I can almost taste this! Oh I have to try this! I think that you’ll like it. I don’t understand the chemistry behind various sugars; but, I agree – It’s all about moderation. I smiled over the tad bit healthier than today’s corn syrup… but probably not much more .😀 oh well, life without a little sugar would be boring. Looks delicious but maple and karo syrups are super expensive in Australia. So won’t be making this anytime soon. I guess that I’m lucky to live in an area where neither is outrageously expensive. Excellent for a special treat. Maple syrup is expensive here too. Until I did this post, I had never thought about variation across regions and countries in the availability of maple syrup. I think that you’d like it. Looks delicious. I tried to make chocolate peanut butter fudge but is was a big miss. You have some great recipe finds and shares! I’ll have to make this for my Dad. He loves maple nut ice cream and I know he’d love this. I’ve already copied in to my recipe files and will make some to take with me on my next trip to see Dad or send it. Do you know how long this will keep or how to store it? Would it freeze well like fudge? I would think it might store and freeze the same. What do you think?